After a brief hiatus last week, we are back with a bang – down to business. As the only response to last week’s puzzle, Paul “Dead-Eye” Kennelly takes the plaudits this time – congratulations Paul! It was taken from Kolb-Schroeder, Nuremberg in 1895. Snipped from the wonderful Van Perlo’s Endgame Tactics. 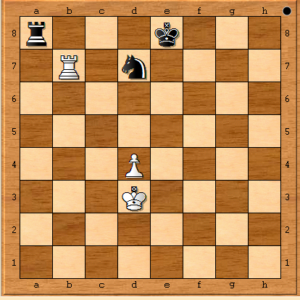 On to this week’s puzzle – White has just played Rxb7 (so it’s Black to move). Why was that a bad idea?? I get these words sent to me everyday from Merriam-Webster. Today’s word is ‘yegg’ which originated in UK but was more often used in US. I reckon Jim could be a ‘yegg’ for getting this tricky puzzle so quickly.